My German friends would go nuts. Here we have the second largest country in the world, with miles and miles kilometers and kilometers of roads through wide, open, flat and unpopulated tracts of land. This land just calls for a German-syle autobahn system without speed limits. Instead, the fastest one can legally go in Canada is 100kph (give or take a few exceptions in the wild wild West, where 120kph are on occasion allowed). It makes for long dreary drives and, unless you care to earn demerit points, a time-tested appreciation for the cruise control feature to relieve the heavy foot. Fortunately, there are roads that are more exhilarating. 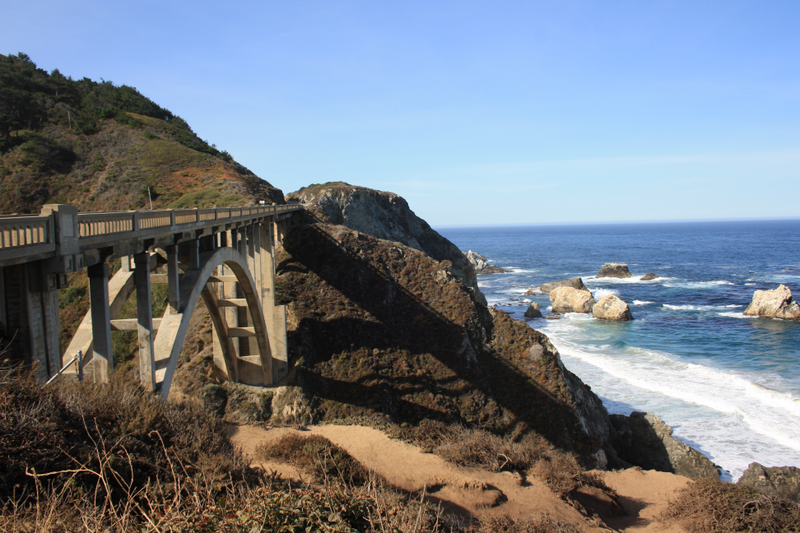 Or more scenic, like the 860km we took in last week down the coast between San Francisco and Los Angeles. Having resisted the urge to upgrade to a not-so-subtle Mustang Convertible, we nonetheless found ourselves rolling down the windows of our rental car and turning up the Beach Boys soundtrack soon after leaving the city by the bay behind us. We embarked on the famous highway 1 south, the winding road along the Pacific that would lead us on for the next few days. Once we had cleared the Tesla-infested redwood forests around Silicon Valley, the view opened up to the ocean, and the breeze infused our car with a tangy salty scent that was much more authentic than the one out of air freshener sprays. The sound of waves crashing competed with the roar of the occasional passing Harley - for highway 1 is firmly in the hands of pleasure drivers these days. Along it, iconic towns such as Santa Cruz with its old school boardwalk, Monterey with its 17 mile peninsula drive, and Santa Barbara with its Spanish colonial style architecture awaited us. Between them, the coastline kept changing: From rugged coves to wide beaches, to dunes and sheer cliffs. Deserted stretches such as Big Sur alternated with coveted residential areas, where villas loomed behind commanding gates. It is true that we were hardly alone: On this long weekend, the roads were busy with RVs, muscle cars and even cyclists, the latter living on the edge in more than one sense. But no matter: We were not in a hurry, and still able to find an uncrowded turnout from which to watch the sunset. When stopping in cities, we set ourselves apart from the hoards by walking a few blocks to downtown (and thereby availing ourselves of free parking to boot! ), using the opportunity to stretch our legs while strolling in the California sun. And when we hiked up a hill a few miles inland, we had it all to ourselves. The typical highway 1 road trip, evidently, does not include unmotorized activities. And that's perfectly understandable, given the beauty and joy of the road. Yes, I hardly went faster than 100kph on the entire trip. But why would I? Even the Germans would have to agree that when you cruise along the Pacific coast, you don't need cruise control. You just coast.